Last 3 days for my Lipstick Week series — it took me quite a long time to finish this, my golly gosh! It’s been a week since my last post, wow. I’ve already drafted the remaining entries but have yet to do the writeups. I promise myself I will finish this series this week!! First off, swatch above does not truly capture the three shades as the lighting was quite harsh when I took these. I edited it hoping it would be at least a little bit true to color but to no avail. Anyway, I have face swatches (that does not sound right at all but I don’t know how they’re formally called) to make up for the fail arm swatches. Cut A Caper is a mid-tone peach with a tinge of pink – for me this is the most coral lipstick I have. It’s of Lustre formulation so it’s quite sheer (the swatch above is 2-3 swipes of Cut a Caper). 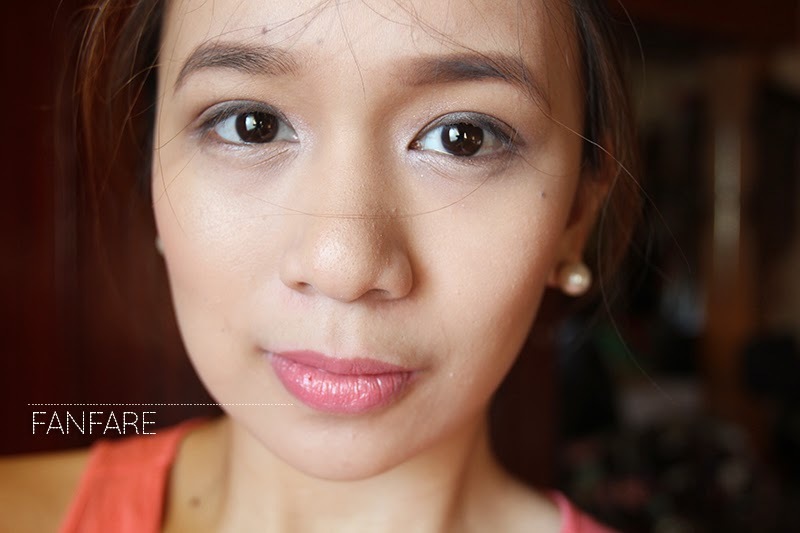 Fanfare (review) is a salmon pink with a hint of coral of cremesheen formulation. Betty Bright is officially described as a light, vibrant peach which does not seem at all the slightest peach to me but more pinky-coral – and is of the satin family. Cut a Caper looks like the younger, more spontaneous cousin of quite-mature Fanfare. It’s a lighter, more coral shade of the two. Fanfare is more salmon and quite muted compared to Cut a Caper. Betty Bright is a bright and adventurous long lost and forgotten relative (or quite possibly not even related) to the first two mentioned. It’s quite closer to being the younger, quite reserved (although still sister of Viva Glam Nicki which is a bolder and much more out-there shade. Overall, I like Cut a Caper the most in terms of coral color and formula. 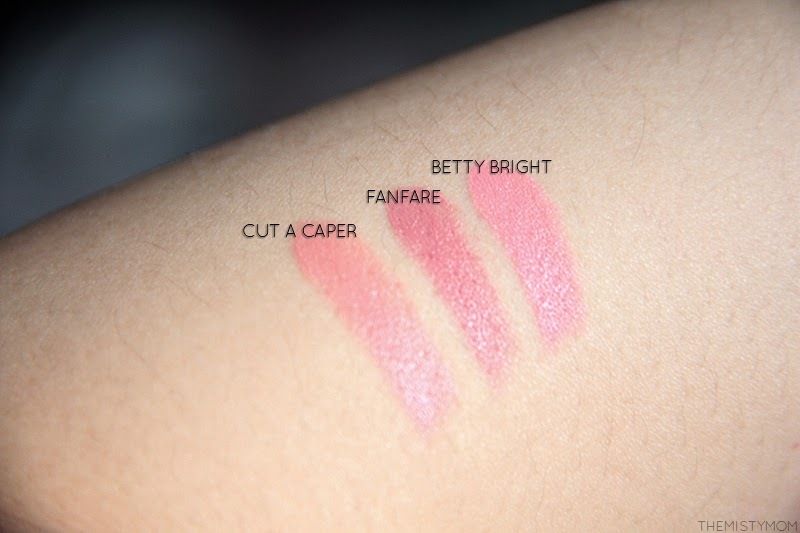 I didn’t think I would like the Lustre formula but because of my reviews on Plumful and now Cut a Caper, I think I’ll be looking into more shades from that line moving forward (should I decide to snap up a MAC lipstick again in the future). 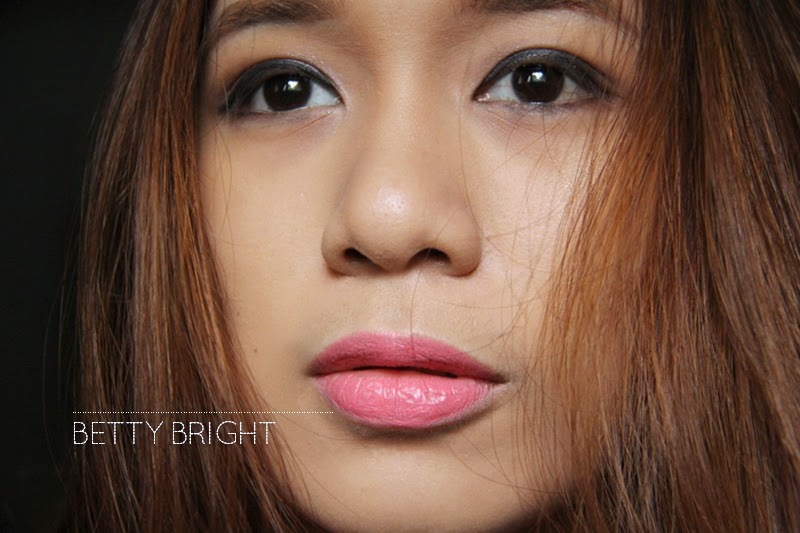 I was too insistent on mattes despite my poor, dry and chapped lips — because it was the most long-wearing. That plus I wasn’t keen on glossy finishes. However, after realizing that MAC mattes aren’t the most forgiving on my lips, I’ll be moving on. In fact, I’m quite over my MAC lipstick accumulation stage. Their new collections don’t excite me anymore. I completely skipped the All About Orange collection without looking back. Truth be told, I think I’m over lipsticks for now. I would only budge for a really great formulation (which I think I may have found in another brand that I will feature in my next entry). Formula > color is my mantra now. *crossing my fingers I don’t get full eating all these words up if (not when) I relapse, which I won’t* Unfortunately, I’ve diverted all that lipstick ‘passion’ into NAIL POLISH. I even contemplated on forgoing makeup and just focus on lacquers but alas, my poor applications skills slapped me back to reality. I can NOT do a proper manicure without pulling all my hangnails, wounding myself and throwing bottles in frustration. 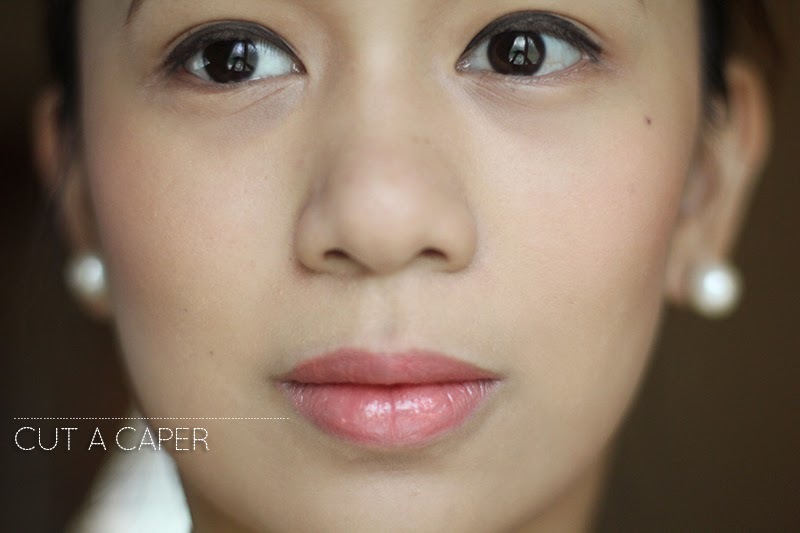 Before I end this, do share with me your go-to CORAL lipstick! Previous Post Lipstick Week Day 4 — Reds! These are all beautiful shades. I love Betty Bright! ahhh! 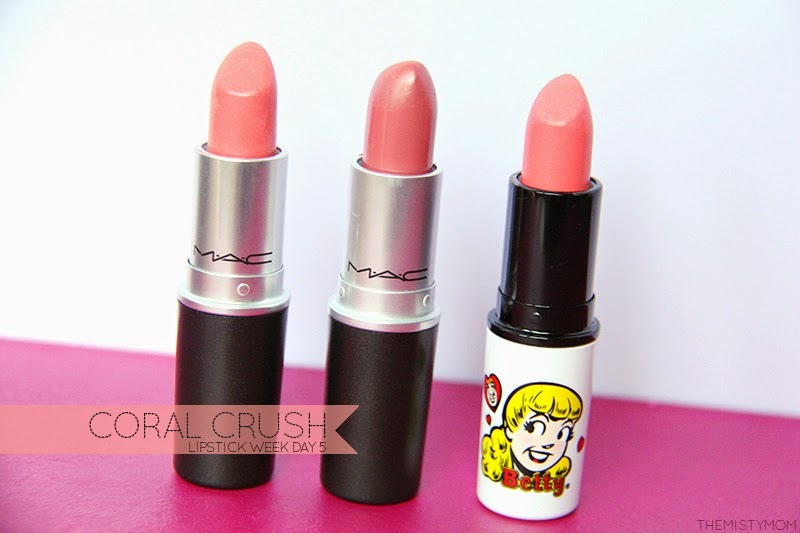 !you have me lusting over MAC lipsticks Shari!1haahaha…love love love your posts!! It is a great color suitable to a variety of skintones! Hahaha thanks Tina kahit di siya sadya at all! I really like the shade cut a caper, its such a lovely bright natural shade, lovely! It’s too bad I rarely wear lippies! They all look lovely on you! Thanks Sharlynn! How come? Well actually I am quite lazy to wear lipstick nowadays too and have been wearing just lip balms most of the time. These are all gorgeous! I might buy one of the first two. Wont go wrong with either shade 🙂 I like the Lustre formula for my dry lips, though. Wow, the colours are really pretty! n__n I’ve never tried MAC lipsticks, but dang – Fanfare is gorgeous! I had a nail polish infatuation last year and now can’t be bothered anymore.. I get your feeling!! Thanks Isabelle! Cut A Caper is a FAVORITE! So sad it isn’t in the permanent range. LOVE LOVE LOVE Cut a Caper, too bad it’s so hard to find. I agree! 🙁 I hope they bring it back! The three colors look good on you! But Fanfare is my favorite! I hope to get one! It’s a nice, versatile color for any occasion! 🙂 Def a good buy! My favorite coral is Chanel’s La Favorite! Try it, it’s in the Rouge Allure Velvet formula. 🙂 I love love love Betty Bright, but it pulls more coral than pink on me than it does on you. Ahh! I almost bought that pero I’m so averse to corals so I passed. I saw it on you and it looks good though! in RAV pa – which is a really GREAT formula. Thank you Rhia! ♥ Yes, Archie’s Girls collection – super nostalgic of my Grade School days when I used to collect Archiecomics. They’re all really pretty! I’d love to get something very orange/coral toned next..
Love Betty Bright on you!! So pretty!